Dying trees in boreal forests point at odd angles as the melting ground underneath them turns to a boggy, greenhouse gas-emitting mush. Photo by Gayathri Vaidyanathan. 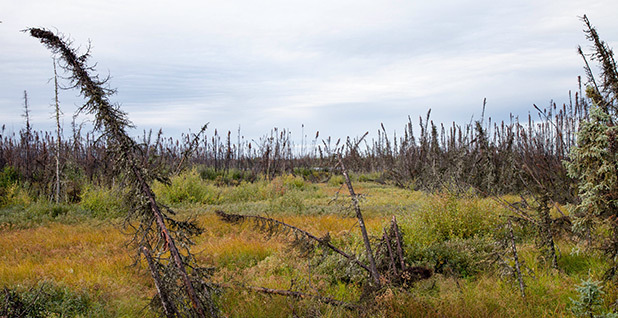 GOOSE LAKE, Northwest Territories -- In a fragile landscape where footsteps leave an imprint for years, Jennifer Baltzer stood and surveyed the surrounding bog of green sphagnum moss. Black spruce trees tilted here and there like drunkards. "You are jamming into ice there," she said. Without that freeze, the unstable spruce trees would entirely lose their footing and drown. Goose Lake is at the knife's edge of climate change. Half a century ago, this region, which is 250 miles from the Arctic Circle, used to contain mostly permafrost, or perennially frozen ground. Today, the ground has partially thawed and the region is predominantly wetland. The rapid changes have been catalyzed by climate change, which has warmed these environs by 4 degrees Fahrenheit in the past half-century. Scientists worry that, as permafrost thaws, a portion of the carbon stored in the northernmost ecosystems will be released to the atmosphere and trigger runaway global warming. The biggest threat at present is posed not by the frozen tundras of the Arctic, but by the soils of the boreal -- the southern reaches of the deep freeze in Canada, Alaska and other parts of the world -- like at Goose Lake, where the permafrost is thin and sporadic, the soil temperature close to melting point, and the land already disturbed by oil and gas exploration. Scotty Creek is the only research station located in the western boreal taiga of Canada. It is part of FORESTGeo, a global effort spearheaded by the Smithsonian Tropical Research Institute to understand how global warming is altering the planet's forests. 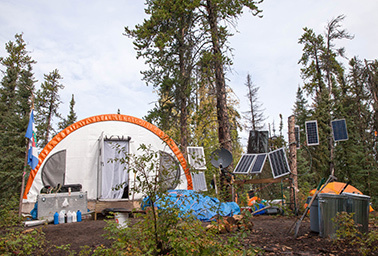 It is one of the few groundtruthing stations for NASA's ABoVE (Arctic Boreal Vulnerability Experiment) initiative, meant to help understand how a warming sub-Arctic will respond to climate change in the next century. "If we do nothing, temperatures in Alaska are projected to rise between 6 and 12 degrees by the end of the century, triggering more melting, more fires, more thawing of the permafrost, a negative feedback loop, a cycle -- warming leading to more warming -- that we do not want to be a part of," he said. At Scotty Creek, Baltzer, 37, chatted with her fellow scientists in the weather haven, a semi-permanent shelter that doubles as a kitchen and meeting hall. In 2014, a fire had ravaged the forest across Goose Lake, turning all aboveground vegetation to charcoal. Baltzer had installed experimental stations at the burn site to track the forest's recovery. Why is this woman smiling? Jennifer Baltzer runs three research projects where melting permafrost could bring on runaway climate change. Photo by Gayathri Vaidyanathan. Bill Quinton, a hydrologist at Wilfrid Laurier, mentioned that his experiments at the burn site might overlap with Baltzer's. Baltzer asked him to eliminate the overlap, and he agreed. 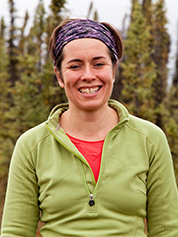 Baltzer is consumed by her research in the boreal and the Arctic. This summer, she spent six weeks on field trips studying how the Northwest Territories' 2014 fire season, the worst on record, had affected the boreal ecosystem. She is running three research projects and is coordinating with the Smithsonian and NASA on two of them. The punishing schedule keeps her away from her two young daughters. "[The boreal] is such a large biome on the planet and, as a consequence, changes in that system have direct impacts on the global climate," she said one evening, sitting on a dock jutting out into Goose Lake. Flies flitted around, and a loon laughed in the background. "I'm not doing a very good job explaining this," she said suddenly, with a sigh. Fens are peculiar surfaces. They consist of blankets of sedges and sphagnum with mostly open water beneath. The helicopter pilot was a novice. He hovered 10 feet above the ground and shouted to the scientists, "OK, throw your stuff out! Now!" Quinton looked at his colleague, who stared back. They threw out their backpacks, which landed on the fen with a splash and quickly sank in. The scientists jumped out and sank waist-deep. "Oh, my God! This is awful," Quinton shouted. "If the trees can stand, I can stand," he thought. The scientists walked to the plateau and established their research station, named after a Scottish hermit who lived and died around here. Since 1947, 30 percent of land at Goose Lake has switched from boreal forest to wetland. The rate of forest loss in the early 21st century was three times as high as in the previous decades, Baltzer said. She has done a census of every tree at a nearby 50-acre plot to see if there are any changes in species composition over time. She is also tracking changes in soil carbon and the rate of photosynthesis. She will redo the measurements in five years' time to track any changes. "The landscape is reorganizing due to permafrost thaw," Quinton said. The weather haven, the combination kitchen and meeting hall for scientists who examine fast-changing life in the tundra. Photo by Gayathri Vaidyanathan. But thaw does not automatically translate to a net loss of carbon at Scotty Creek. Oliver Sonnentag, 41, an atmospheric scientist and wannabe float plane pilot, keeps a close eye on the CO2 and methane entering and exiting the site from a monitoring station on top of a $90,000, 165-foot-tall tower. This August, he dispatched his field technician, Karoline Wischnewski, to clean the sensors. A large spider appeared above her on the harness rope, and Wischnewski eyed it. She is usually unfazed by the challenges of living in the north, an attitude reflected in a wooden plaque she has hung at the weather haven that reads, "Life isn't living with the ponies." "I don't like spiders," she shouted down to Sonnentag, and then calmly polished the sensors. The measurements here follow the protocols established through FLUXNET, a global network of 500 sites tracking local changes in the CO2, water and energy balance in order to construct a detailed picture of Earth system changes. Sonnentag said this tower was particularly difficult to install, since it is founded in permafrost that is susceptible to degradation. Over three years, the ground has subsided by 20 centimeters. "If the permafrost [completely] thaws out, then this thing has no foundation, it is gone," he said, standing at the base of the tower. "Overall, these preliminary results suggest that there is more methane coming out, but at the same time, more CO2 is taken up," he said. Once the bogs drain out and dry in the future, they may become sources of CO2. "A big concern about what is happening is that you've got drier conditions that promotes more frequent big fire years and more severe fires," Baltzer said. "It is Baltzer, her eye in the sky," Quinton said. "I'm afraid there's going to be a loudspeaker on it, 'Quinton, back to the camp!'"